Orthostatic hypotension is an important, treatable cause of dizziness, syncope and falls. Less frequently it leads to visual disruption, dyspnea on exertion, angina and even stroke. Orthostatic hypotension also known as postural hypotension results from a failed sympathetic response when standing upright resulting in decrease venous return and cardiac output causing dizziness, syncope and/or fall. Important to note that a common problem in patient with orthostatic hypotension is the concurrent presence of supine hypertension. Standing up from a recline or sitting position results in pooling of 500-1000mL of blood in the lower extremities and splanchnic circulation. 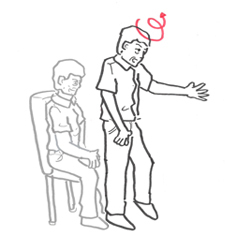 Have patient modify behavior by standing slowly and step-wise, and lying down at prodrome.